In Hakodate, the battle rages on between alien squid from the planet Ikaaru and giant robots shaped like the city's landmarks. 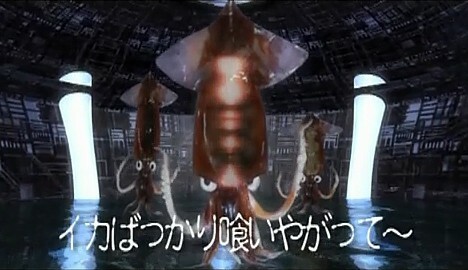 In their latest offensive, the dastardly squid invaders have muscled their way into the trailer for "It's on Me" (Watashi Dasuwa), a new film shot on location in Hakodate. The film, which debuts today at the Tokyo International Film Festival, is a low-key drama about a woman who returns to her hometown to spread the wealth she accumulated in Tokyo. 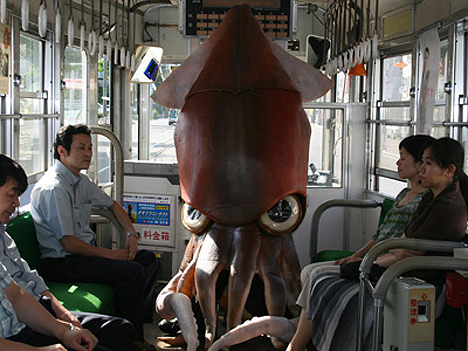 Although the story itself has nothing to do with aliens (and unfortunately no extraterrestrials actually appear in the film), it happens to be set in Hakodate, which is home to an unconventional tourism campaign involving giant robots that defend the city against alien cephalopods seeking revenge on a population that eats too much squid. This tourism campaign has now wrapped its tentacles around the film. The new and improved trailer, which was recently posted on the film's YouTube channel, is nearly identical to the original version, except for the appearance of alien invaders. Only in Hakodate. 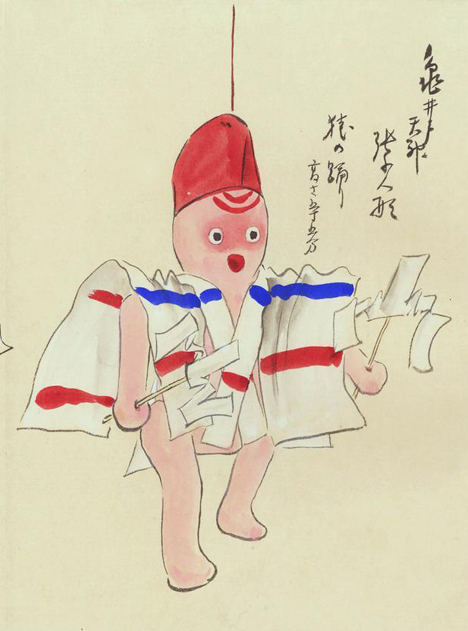 The Ningyo-do Bunko Database is a huge online collection of watercolor paintings by Kawasaki Kyosen (1877-1942). 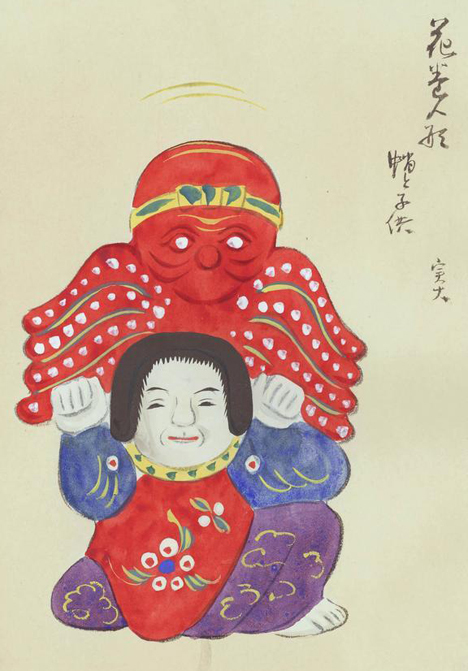 The collection consists of over 5,000 still-life images of antique toys and folk crafts from across Japan, including a few lovely octopus-themed items. 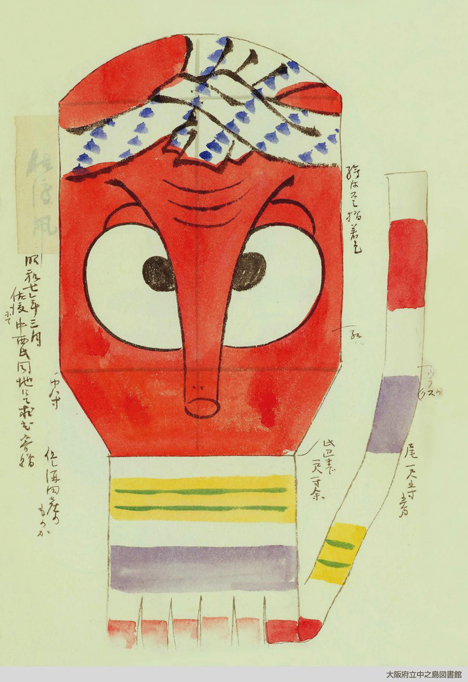 The collection is organized into 60 galleries (Japanese only) that can be navigated by clicking the thumbnail images and arrows. The city of Hakodate, Japan has been producing official tourism videos unlike any you've ever seen before -- action-packed affairs starring famous landmarks as giant robots that battle a runaway mechanical squid hijacked by vengeful aliens. The first video begins with an interesting factoid: According to a survey of 100 aliens, Hakodate is the number one city they would most like to invade. 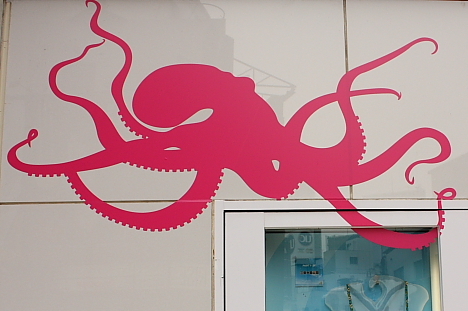 The invaders here are alien cephalopods from the planet Ikaaru, who seek revenge on the people of Hakodate for eating too much squid. The aliens hijack an enlarged version of Hakodate's tourism mascot -- a mechanical squid named "Ikabo," which was built by Future University-Hakodate (FUN) in 2007 -- and send it on a rampage through the city. Angry alien squid from Ikaaru: "All they eat is squid!" A pair of giant robots are called into action to protect Hakodate's precious historical buildings from destruction. 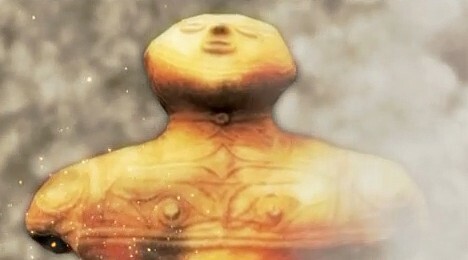 Hakodate's Goryōkaku Tower transforms into a deadly fighting machine, while an enormous Chūkū Dogū (a treasured 3,200-year-old hollow clay figurine unearthed in Hokkaidō in 1975) awakens from a deep slumber. The city's star-shaped Goryōkaku fortress also joins the fight. After coming under attack, the fortress rises up from the flames and takes off like a giant spaceship. 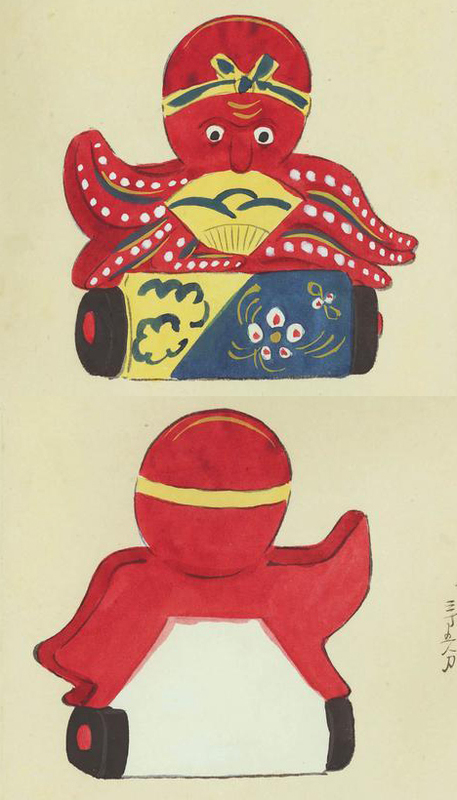 In the second video, the battle between the hijacked Ikabo squid robot and the Goryōkaku Tower robot rages on into winter. In the final video, the fierce battle appears to end as the Goryōkaku ship delivers a deadly blow to the Ikaaru spacecraft. But the fight has really only just begun -- another fleet of alien ships is fast approaching. Hakodate appears to be under full-scale alien attack and its survival is in question. Visit Hakodate soon... before it's too late. Recycle artist Masataka Koike creates realistic-looking marine life sculptures from used wooden chopsticks. This octopus, which took eight months to complete, is made of 2,000 chopsticks. In nature, it is quite rare to encounter octopi with extra tentacles (or "arms," for the purists), but a pair of aquariums in Japan's Mie prefecture have some extraordinary specimens on hand. The permanent display at the Shima Marineland Aquarium in the town of Shima includes a 96-tentacled Common Octopus (Octopus vulgaris) that weighed 3.3 kilograms (about 7 lbs) and measured 90 centimeters (3 ft) long when it was captured in nearby Matoya Bay in December 1998. 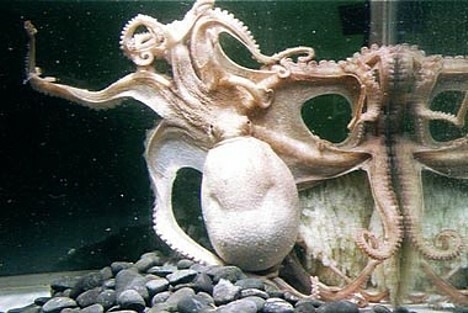 Before dying 5 months later, the creature laid eggs, making it the first known extra-tentacled octopus to do so in captivity. All the baby octopi hatched with the normal number of tentacles, but unfortunately they only survived a month. 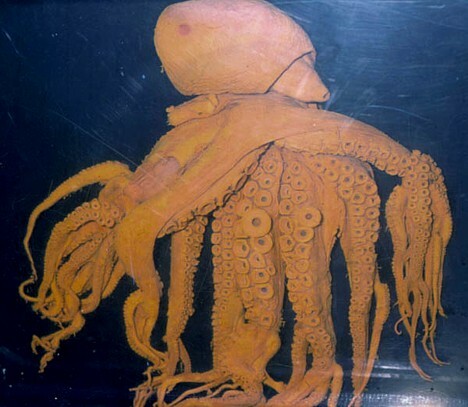 The preserved octopus actually has the normal number of 8 appendages attached to its body, but each one branches out to form the multitude of extra tentacles. 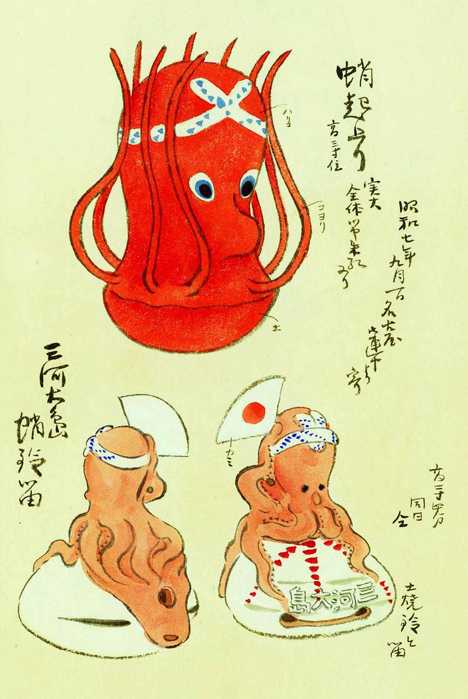 Apparently there is no theory that fully explains the surplus tentacles, but they are believed to be the result of abnormal regeneration that occurred after the octopus suffered some sort of injury. 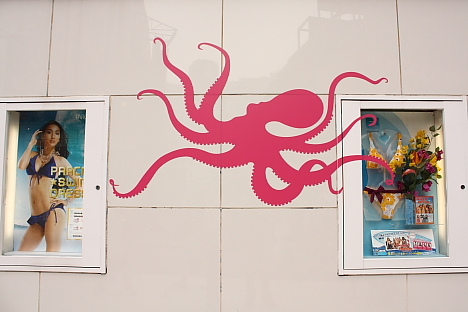 The Toba Aquarium in the nearby town of Toba also has a few extraordinary octopus specimens, although they no longer appear to be on permanent display. Every now and then, though, the aquarium pulls them out of storage for the world to see. 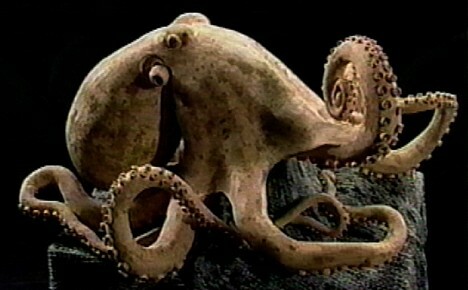 Their most well-known specimen is an 85-tentacled Common Octopus captured in 1957 at nearby Toshijima island. 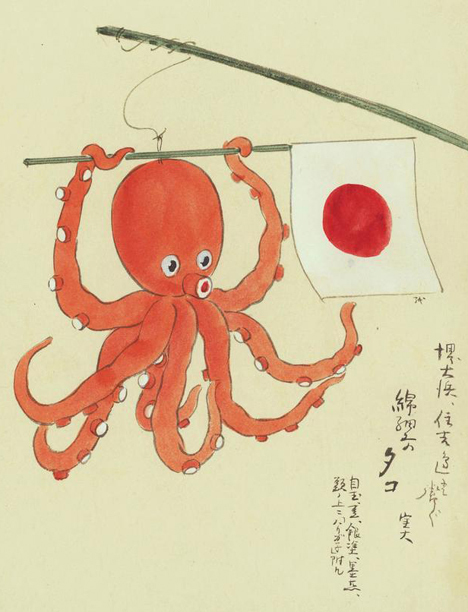 This remarkable creature -- which, like the Shima Marineland octopus, has 8 main arms that branch out to form scores of tentacles -- made quite a stir when it first went on display at Toba Aquarium a half-century ago. 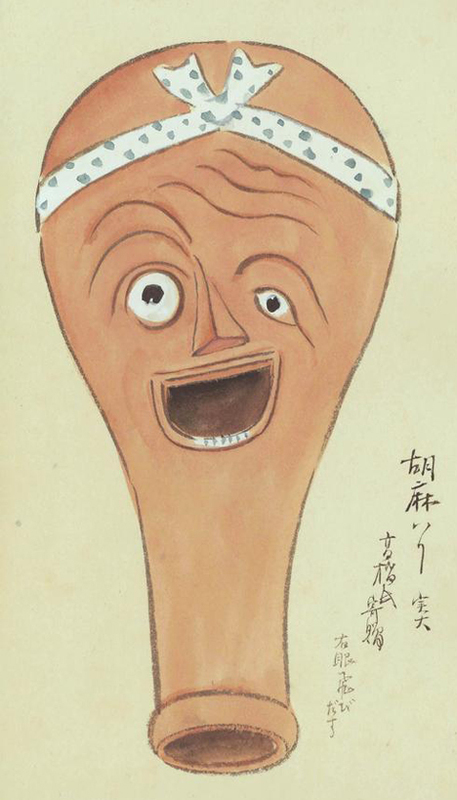 A few years later, the specimen was loaned to the National Museum of Nature and Science in Tokyo, where it famously caught the attention of the Showa Emperor. The renowned creature eventually returned to Toba and went on permanent display until the aquarium moved to a new location in 1985, at which time it was placed in storage. Twenty years later, in 2005, the specimen entered the spotlight again when it was put on temporary display. 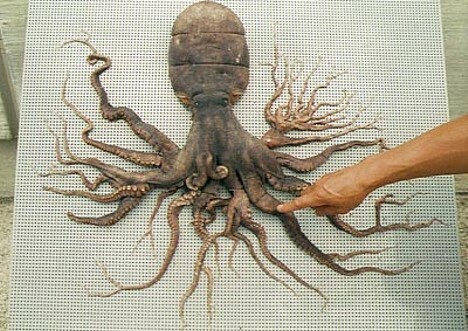 In the 50 years since the 85-tentacled octopus was captured, the Toba Aquarium has exhibited 6 other mutant octopi, most of them alive for a time, and each with between 9 and 56 tentacles. 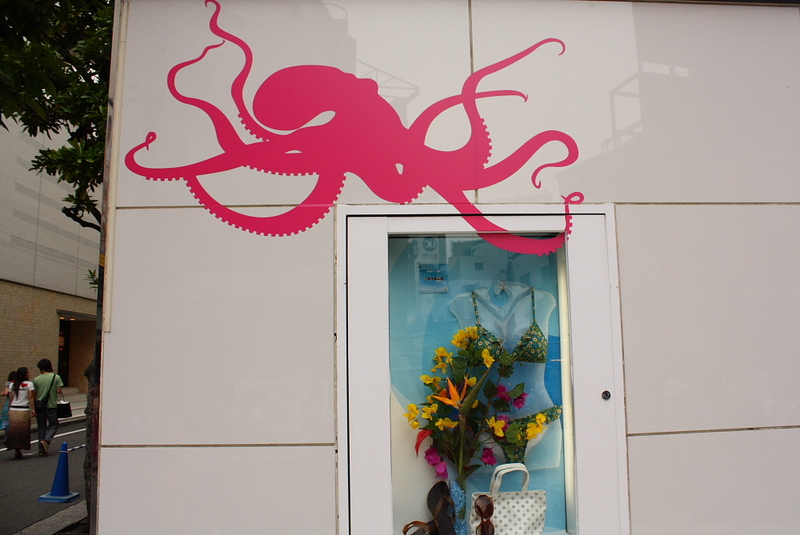 These oversized octopus stickers on the wall outside the Shibuya Parco building are dangerously close to the swimwear display. 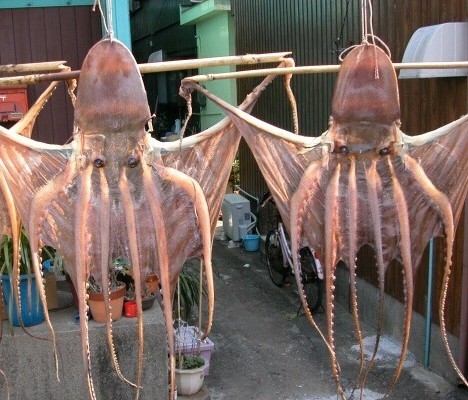 It is a common sight in winter to see octopi hanging out to dry along sidewalks in the town of Toba (Mie prefecture), according to the caption for this image from the Toba Photo Gallery. An octopus with nine tentacles was spotted at the Marusan Seafood Shop in Marugame, Japan (Kagawa prefecture) on October 26, one day after it was caught in the Seto Inland Sea. 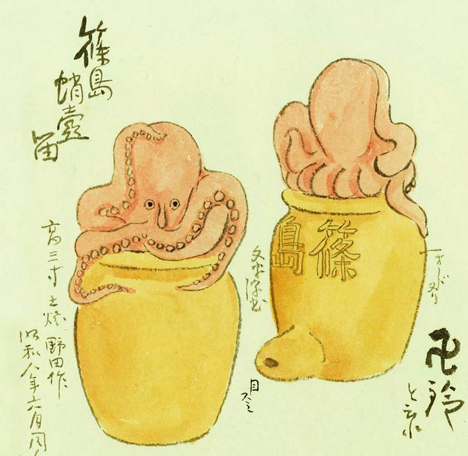 Masa Koita, the 60-year-old shop manager, noticed the abnormal Common Octopus (Octopus vulgaris) after he had boiled it in preparation for market. 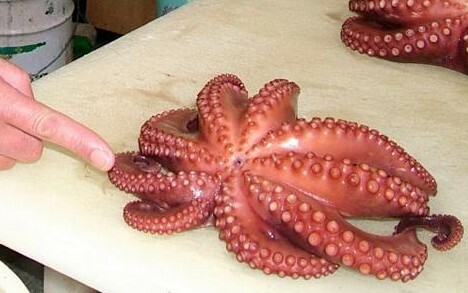 "In 40 years of handling seafood, I've never seen an octopus like this," he said. 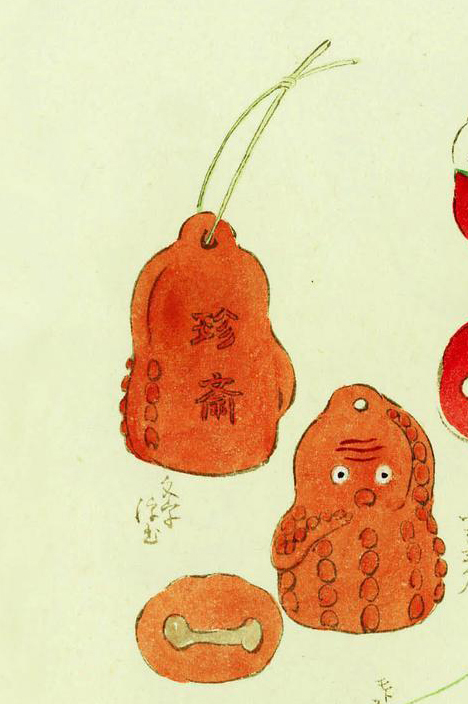 A spokesperson for the Akashi Seafood Council in nearby Hyogo prefecture confirmed the unusual nature of the extra-tentacled creature: "In Akashi, we might see one every 20 years or so. They are extremely rare." 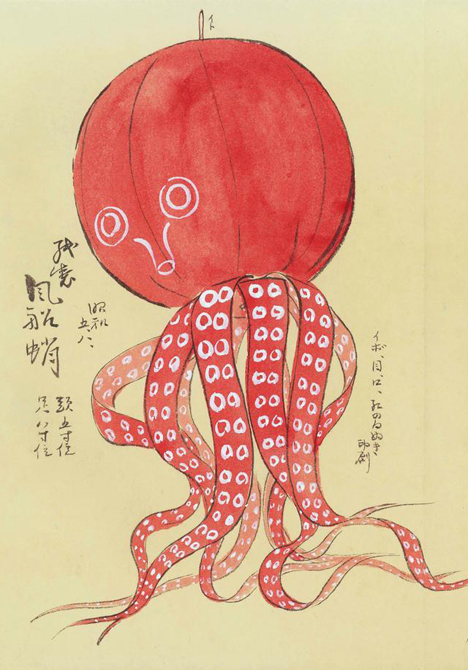 Koita says he will show off the octopus for a few days before selling it to a lucky customer. This video clip from Japanese TV program "Best House 123" shows the top three glow-in-the-dark sea creatures selected by Hokkaido University professor Yoshihiro Omiya, a specialist in the study of bioluminescent organisms. 3. Firefly squid: This blue-glowing squid, Japan's most famous bioluminescent creature, measures 5 to 7 centimeters long and is often found at depths greater than 200 meters. In spring, when firefly squid rise to the surface to spawn en masse, they become Toyama's great tourist attraction and end up on dinner plates nationwide. One reason the firefly squid glows is to hide itself from predatory fish swimming below. When the squid lights up its bottom surface, fish looking up have a hard time seeing it because it blends with the sky above. 2. Bioluminescent plankton: Measuring 0.1 centimeter long and found in oceans around the world, this type of dinoflagellate glows blue when disturbed. Professor Omiya keeps a flask of the light-emitting plankton in his fridge, because just looking at the cool blue glow helps him relax when he's feeling stressed. While bioluminescent creatures are generally believed to emit light in order to intimidate their enemies, attract mates or defend themselves from predators, it is not entirely clear why this plankton glows. 1. Bioluminescent comb jelly: This 10 to 15 centimeter long gelatinous deep-sea creature, found at dark ocean depths of more than 200 meters, glows seven different colors in an otherworldly display of light. Many questions remain unanswered about why this comb jelly glows, making it a fantastic rainbow-colored mystery.